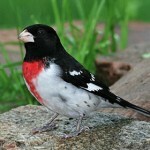 Loud, rich “chip.” Song is lively warbling whistle with phrases and trills; thin and sweet. 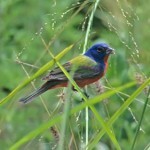 Description: Adult male’s colorful plumage is retained year-round, however the first year male is greenish in color. 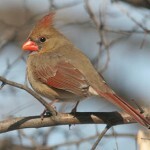 Purplish-blue head; lime green back; bright red rump and underparts; dark wings and tail. Female is bright green above; paler yellow-green below. Juvenile is similar to female but paler. Behavior: Male sings all year round except during late summer when it molts. Habitat: Low thickets, weedy tangles, streamside brush, and forest clearings and edges. Where in Nebraska Accidental. Sight records for Scotts Bluff County in 1927; Adams County in 1962; and Sarpy County in 1967. Most recent sighting for Hall County in 1996. Fun Facts: Males were once favorite cagebirds because of their beautiful plumage; birds seen out of their normal range may be escaped caged birds. 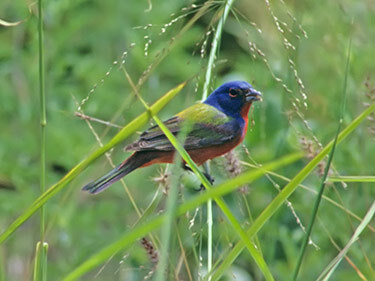 Painted Bunting males will fight for territory and females by pecking, beating with wings, grappling, and it sometimes will result in death.